August 31st was Riley’s first birthday. I can’t believe she is already one! She got a few presents and has been having so much fun playing with her new toys. 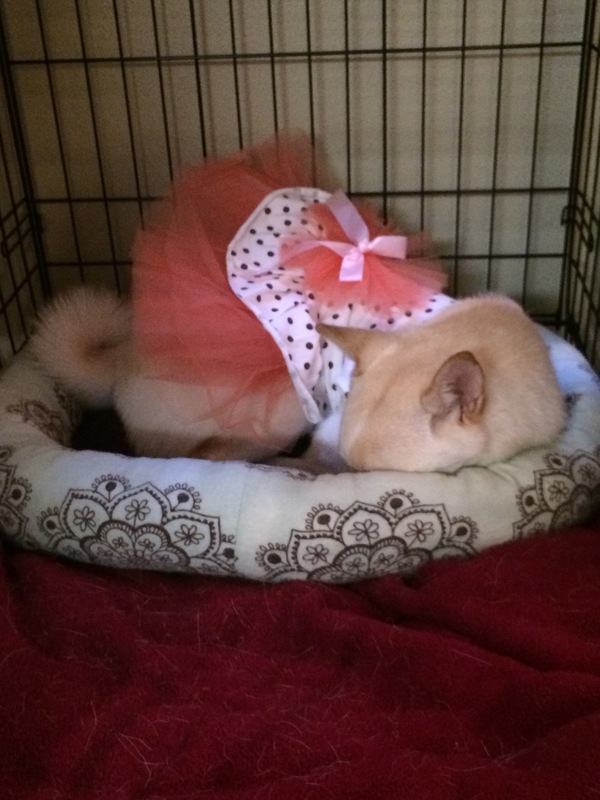 I forced her to wear the new dress that I bought her, and she actually tolerated it pretty well. 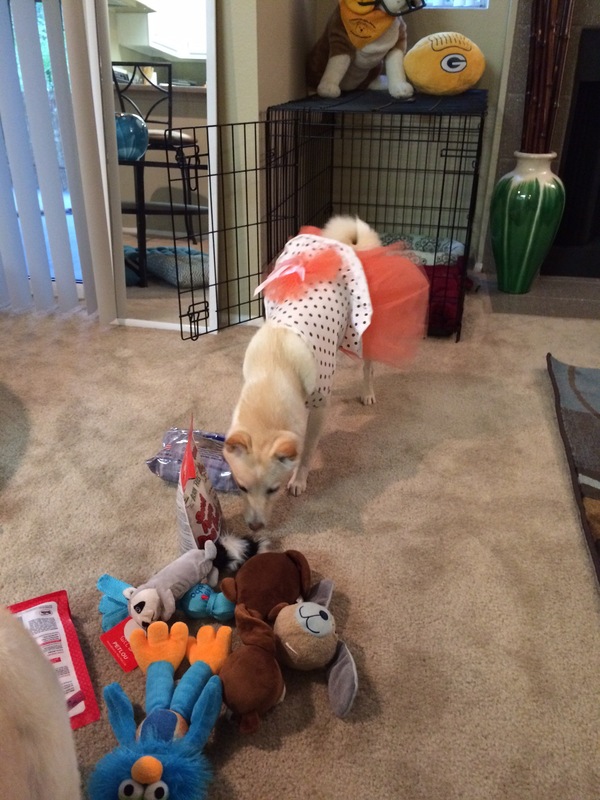 Riley having a little snack from her pile of loot, and Kuma looking on in jealousy. 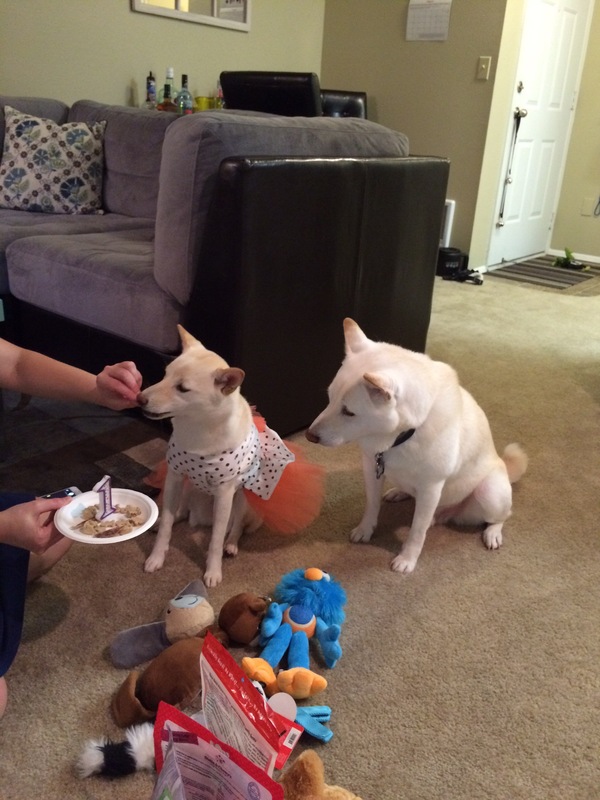 Does anyone else celebrate their pets’ birthdays? I just can’t help it, she’s so precious. You already know I do!!! Love her dress! Happy Birthday Riley! Happy birthday Riley! I wish there was a like button. 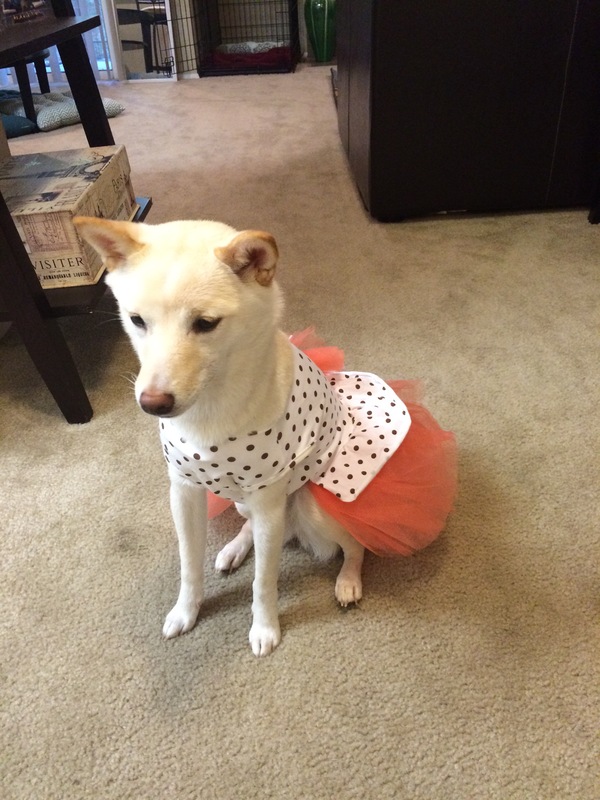 Well, now I’m just picturing fish in dresses and it’s so cute! Thank you, I can barely stand how adorable the dress is. I can’t say we celebrate birthdays for our cats… but we don’t actually know their birthdays since they were both from the SPCA… But we do give them Christmas presents… And Riley does look super cute in her dress! Aww, thanks! Yeah, I never knew my cat’s birthday either. Riley is from a rescue, but it was a big puppy mill bust so I was lucky enough to have her birthday. I used to give my cat a stocking. It was sooo cute to see him fishing out the treats and toys. Do your cats do that? Big cat will tear through packaging if it’s something that he likes… A few years back, my roommate attempted to give him a bag of catnip. She wrapped it and put it under the tree, but he kept finding it and tearing open the paper. Eventually she put it inside a tuperware container and wrapped that so that he couldn’t smell it and try to get to it before Christmas. That is so darling. I mean, probably frustrating lol. But so cute. Thanks 🙂 Pets are my favorite!